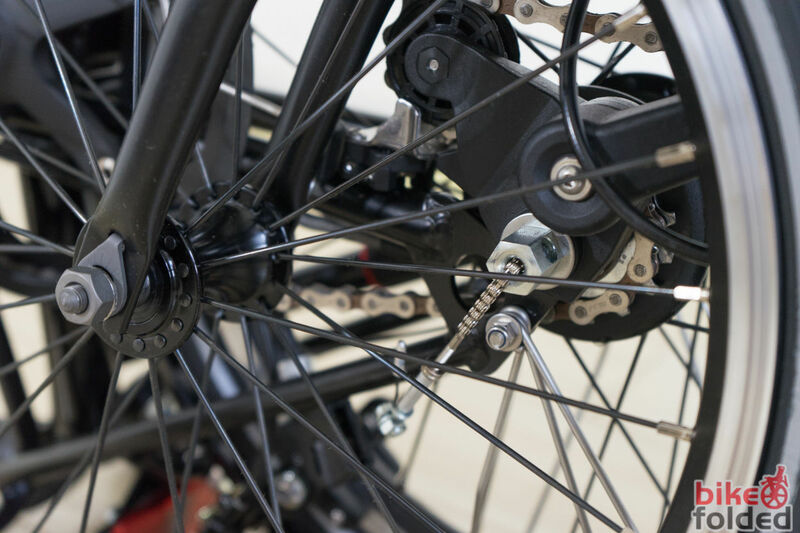 Brompton's Front Wheel Spokes Hit Rear Derailleur When Rolling - How to Fix It? 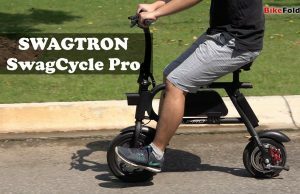 Brompton’s Front Wheel Spokes Hit Rear Derailleur When Rolling – How to Fix It? 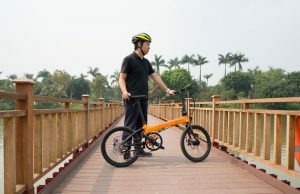 I was so excited to try my new Brompton Black Edition folding bike as I thought it would be a perfect commuting solution for me. However, I had a problem with this bike right on the first day riding to work. 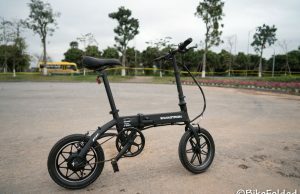 In fact, the riding performance is good and I just found out the issue when rolling the bicycle in shopping cart mode. Specifically, when I pushed the handlebar to roll the bike, I started hearing some loud pinging sounds. After some investigation, I figured out that the noise comes from the collision between the front wheel’s spokes and the chain tensioner nut. The nut is installed outside of the rear derailleur and it helps keep the chain taut when the Brompton is in folded or unfolded position. The nut protrudes more on my bike since this is the 6-speed Brompton M6L. 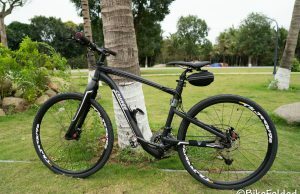 Therefore, when I roll the bike, the front wheel makes contact with the ground and rotate as well. The tiny rolling wheels on the rear wheel obviously can’t provide enough clearance to lift the front wheel. So, when you roll the bike, there are more chances the spokes will hit the nut. I had to tilt the bike slightly to temporarily fix the issue. If the problem persisted, it would be a huge disappointment. 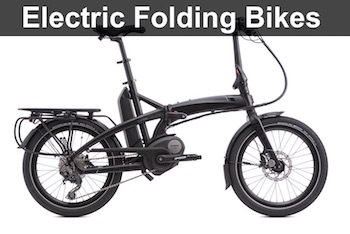 It’s really unacceptable as a leading folding bike manufacturer like Brompton could make that design defect when everything else is brilliant. I had to find a solution myself and surprisingly, a simple change fixed it. All you need to do is screw the handlebar catch, flip it over, and then screw it back again. I did the trick and couldn’t understand how it solved the problem. 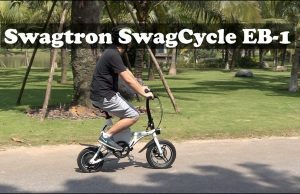 If you have the same issue with your Brompton, let me know if the trick works on your folder. Wow, what a find. It worked for me too! 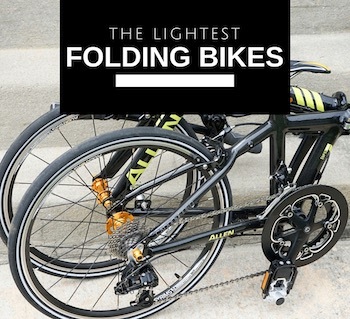 Upon closer inspection, it looks like one side of the handlebar catch has a thicker side that presses against a small plate at the bottom of the head tube, rotating the fork and the wheel a bit when folded. When you flip it, you can also take out the wire part and insert it to the top side as well. Could it be that this is simply an assembly mistake? I wonder if it’s factory or dealership who mounts those catches? I have had an M6R since June and have noticed this problem rolling over bumpy surfaces but had no idea how to fix it until now thanks to you! This problem has discoloured the black spokes and rubbed some metal off off the indicator chain. I think I might get a wee Q rack for better rolling anyway, just for fun. Worked for me too on M3L. Nice one! Whew! Same problem here, and same solution worked. Holy crap! Amazing! I bought a 6l last month and this has been the biggest pet peeve of mine. I even asked the place where I bought it–Brompton Junction, no less!–and they did not have a solution as easy and elegant as this! Thank you! I cannot believe how much of a difference it makes–night and day. It’s not just that the sound is gone, it rolls SO much better! It worked for me as well. The trick works because, the handlebar catch has a little bump on the side. I think it was mounted wrongly at delivery or seller. If you look detailed at the catch you can see it. So if you mount it flipped, it creates some space, so that the handlebar can not turn certain point. merci !!! je viens d’inverser l’attache et effectivement je n’ai plus de frottement chainette/rayon ! super de partager cette info ! Been riding my bike for a year and this issue just came up. Glad its fixed.Thanks! Interesting fix. You could also push down and out lightly on the front mudgaurd stay (where the black L catch is). Those mudgaurd stays are flexible and by pushing it down slightly you raise the sitting position of the front tire in the folded position while maintaining the tighter fold.